One of America’s oldest educational institutions, the 220-year-old Episcopal Academy opened a new 123-acre campus in Newtown Square, 13 miles west of Center City Philadelphia. The school drew on their considerable resources and put together a dream team of East Coast architecture firms to design a new campus. The 63,000 sq. 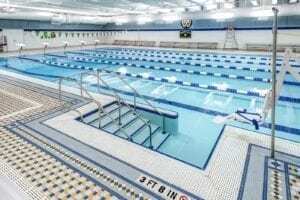 ft aquatic center houses a six lane stretch 25 pool with seating for 250 spectators; it has two moveable bulkheads that are flexible enough for water polo, swimming, diving, and instructing young children. 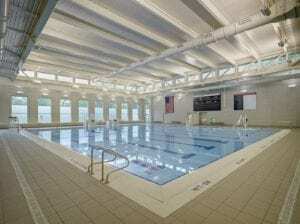 Episcopal is one of only 15 schools in the area that offer swimming, and has both boys’ and girls’ teams. The academy introduces water polo to third and fourth graders in physical education classes, and has a middle school club team, with the hope of providing the sport beyond the fall scholastic season to students from other schools.